Thirty two war affected families from refugee camps in Adapankulam, Poonthottam, Sithamparapuram and Manik Farm in Chettikulam moved Sunday morning at 10 a.m into a new resettlement village in Puliyankulam North built by Tamil Rehabilitaion Organization with funding support from NewZealand Tamil expatriates, sources in Kilinochchi said. The families were selected as the most poor and deserving of those languishing in the different refugee camps. 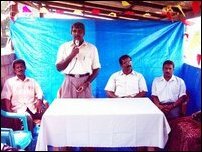 TRO's Vavuniya district Director, Mr Thirugnanasampanthamoorthy, presided the event. 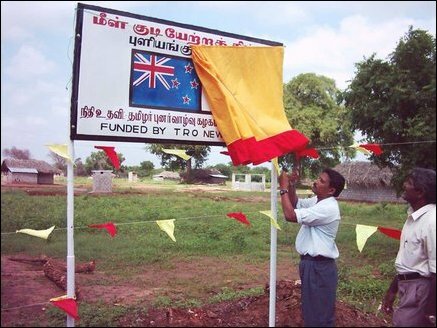 Following the lighting of ceremonial lamp and the hoisting of Tamileelam flag, LTTE Vavuniya district Head of Political Wing, S. Gnanam, unveiled the name board for the new village. Resettled families were also provided with furnishings, kitchen utensils in addition to tools to allow members to embark on self-employment activities, TRO officials said. LTTE Deputy Head of Political Wing, S Thangan, Vavuniya District Project Co-ordinator, Ms Viyaluxmi Ketheswaran, Head of LTTE Women's Political Wing in Vavuniya district, Ms Avarthana spoke in the opening event. 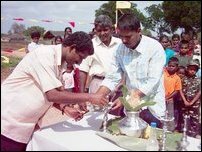 In addition to the new owners of the houses in the resettlement village, Student Union Officers, Vavuniya District Economic Development officials, civil society members and several members of the public participated in the event.